This cabinet card was featured in the Shades article Multigraph/Fivefold-Portraits. The unassuming looking gentleman had an extremely interesting life and an equally intriguing famous daughter. This week's Photo Of The Week explores the research found for Hiram Heaton of Amherst, Massachusetts. (1) The card measures 4 1/4 in. (h) by 6 1/2 in. (w) and is 0.03 in. thick. The image measures 3 14/16 in. (w) X 5 1/2 in. (w). The corners of the card are rounded with gold edge. The card stock's original color appears to have been cream (matte finish) for the front and beige for the back. There is no border line. The ink used to identify the photographer is also gold. (2) The photographer’s imprint on the front (recto) lists the photographer as H.E. Bosworth, Springfield, Mass. with the logo HEB. (3) The back (verso) of the card is pictured below. There is a snapshot attached to the back. 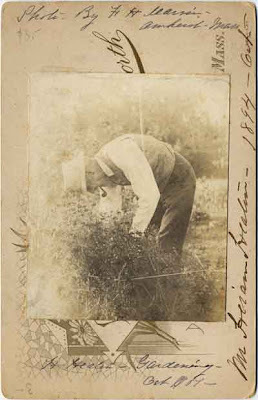 Below the snapshot is written, Mr. Heaton gardening - Oct 1909(?). Along the right side of the card is written (in a much stronger hand) Mr. Hiram Heaton - 1894 - Oct. - . Above the snapshot is written Photo By F. H. Marvin - Amherst, Mass. (4) The card is a Multigraph, Fivefold-Portrait. The card stock and size are consistent with photographs produced during the period of time on the back of the cabinet card. H.E. Bosworth is listed as a photographer doing business at 321 Main Street in the Springfield, Massachusetts City Directory of 1894. The photograph is consistent with the 1894 date handwritten on the back of the cabinet card. 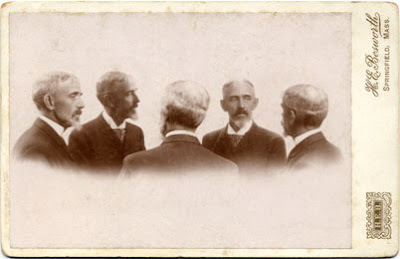 Hiram Heaton was born 2 April 1844, in Moriah, Essex County, New York. In 1870, twenty-nine year old Hiram Heaton worked for his mother, Mary Heaton, in the inn she owned in Stockbridge, Massachusetts, known as the Stockbridge House. It would later be called the Red Lion Inn because of the sign depicting a red lion that hung over the tavern in the 1700s. The Stockbridge House was immortalized in the Norman Rockwell painting Stockbridge Main Street at Christmas pictured below. The Stockbridge House is the last building on the far right. A literary colony was established in Stockbridge and the town and the inn were soon "discovered" by wealthy families who came to escape the hustle-bustle and grit of big city life. One such wealthy family was that of Ellen Cordelia Blackman Marvin, a thirty-nine year old widow with five children who traveled to Stockbridge in 1873 and vacationed at the inn. Ellen was the widow of Captain Charles Bernard Marvin who had made a fortune in the china trade during the San Francisco gold rush. He had also been a liquor merchant in the boomtown that was early San Francisco. Marvin married the much younger Ellen and purchased the governor's mansion in Burlington, Vermont, as their first home. The five Marvin children were Nellie, Charles, Frank, Bessie, and Sidney. Ellen met Hiram Heaton and was immediately attracted to the young intellectual. Seven years her junior, Ellen convinced Hiram to marry her and travel the world. And travel they did for the next six years. On 9 October 1874, in New York City Ellen and Hiram welcomed their only child, a daughter, Mary Marvin Heaton. It is a sign of the power wielded by Ellen Heaton and her purse strings that Hiram's only child had as her middle name the surname of Ellen's first husband. Hiram apparently became quite accustomed to wealth, listing his occupation in the 1870 census as a gentleman of leisure. I would guess his comfort with wealth was the reason Ellen continued to control the family. Mary traveled with her parents attending kindergarten in Germany and art school in Paris. Hers was not a conventional education. She was educated by her father and his friends throughout the world. While Charles and Nellie Marvin both married and started their own families when Mary was very young, Mary enjoyed the company of her half-brother Sidney,who went to Europe to study medicine, her half-sister Bessie who was involved in music and her half-brother Frank who was a painter. Frank H. Marvin, Hiram's stepson, was living with the family in Amherst in 1910 and is the photographer of the snapshot attached to the back of the cabinet card. 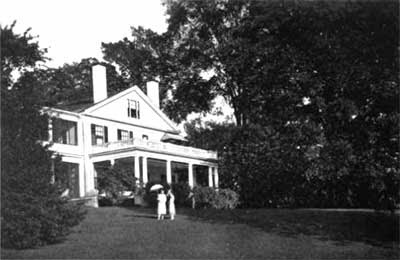 On October 7, 1879, Hiram Heaton purchased the house at 39 Amity Avenue in Amherst, Massachusetts, as the family's summer home. He filled its grounds with choice trees, shrubbery and flowers and took up gardening in his retirement. Amherst was a college town filled with intellectuals who often stopped to visit Hiram, share a beer and conversation. Emily Dickinson was one of the Heaton's visitors along with the writers and professors that populated the college town. It was here Mary Heaton learned to write stories that were almost as successful as Eugene Field's poems. The Heaton's lived a very comfortable and sheltered life. At the age of twenty-three, Mary Heaton met Albert Vorse, a Harvard graduate, journalist, and aspiring author eight years her senior. They married secretly in New York after a five-week courtship, and again in a public ceremony at the Heaton home in Amherst on 26 October 1898. Vorse was a newspaperman and aspiring author. In 1892, Albert White Vorse had been a member of the Peary Relief Expedition for the Philadelphia Ledger and kept a keen interest in arctic affairs and in exploration. Vorse was interested in aeronautics and had made several ascensions. He and Mary had two children; Heaton White born 18 December 1901, and Mary Ellen born 8 May 1907. The Vorses were happy in the first years of their marriage. Bert's career as an editor advanced and he was able to sell some writing on the side. Mary began her writing career by selling book reviews to the Criterion. Mary continued to write and became very successful penning her first book, The Breaking in of a Yachtsman's Wife. Vorse not only resented her success, but was also a philanderer of whom Mary's mother Ellen disapproved. Albert and Mary led a lifestyle very similar to that of Mary's as a child. They traveled extensively in Europe. In 1910 Mary, Albert and their children again traveled to Italy and France. In Paris Vorse left his family and hurriedly returned home to complete a work on aeronautics for publication. He left behind his wife and children who were scheduled to return later. To insure quiet Vorse took a room in a little Italian Inn on Staten Island. He was found unconscious in his room and was taken to the hospital where he died of a cerebral hemorrhage without gaining consciousness. That same day, June 14, 1910, Ellen Blackman Marvin Heaton died in Amherst, Massachusetts of heart failure. Mary, at sea and on her way home, received a wireless message aboard the Prinzess Irene that her husband and her mother had both died suddenly on the same day. Mary arrived home to find that her extremely wealthy disapproving mother had written her out of the will. Mary became the sole support of her family and began her writing career in earnest. Her elderly father, Hiram, came to live with her in New York. I have been unable to find the date of Hiram's death, but Mary writes of her father in the past tense in 1914 in her novel, A Footnote To Folly. I have assumed (rightly or wrongly until I have more information) that Hiram died sometime between June 1910 and 1914. He is not found in the 1920 census. In 1912, Mary Heaton Vorse's observation of the Lawrence Massachusetts textile strike changed her life. From that day forward she only wrote fiction to support her children and finance her life as a foremost American labor journalist and activist. It was during this time she met and married the freelance writer, socialist, and suffragist Joe O'Brien. They had one child, Joe O'Brien, born 17 June 1913. Here is one of those six degrees of separation moments. Mary and Joe held an International Conference Workers' meeting in Carnegie Hall in 1913. They would have had contact with my Great Grandfather Louis Salter as he was the Superintendent of Carnegie Hall and was charged with all lectures. In 1915, Mary was again widowed when Joe O'Brien died of cancer. Shortly after O'Brien's death Mary attended the Women's International Peace Conference held at The Hague. Once again a widowed single, working mother and a suffragist, Vorse became even more concerned with feminist issues. In 1920 Mary fell in love with Robert Minor, a cartoonist who eventually became the secretary of the American Communist party. They never legally married and had no children. They separated two years later. The separation from Minor did not affect Mary's commitment to radical, democratic socialism, which prompted her coverage of the 1914 Industrial Workers of the World unemployed movement; the 1916 Mesabi Range, Minnesota, mining strike; the 1919 national steel strike; and the 1920 Amalgamated Clothing Workers' strike. After traveling to the Soviet Union in 1921 and 1922, Vorse resumed her famous reporting on militant labor disputes. She witnessed the 1926 Passaic, New Jersey, textile strike and the Congress of Industrial Organizations battles waged across the nation in the 1930s. In 1931 she was driven out of "Bloody Harlan County," Kentucky, by night riders. In 1937 Mary was wounded by the gunfire of vigilantes at the Republic Steel Corporation plant at Youngstown, Ohio. She was covering the strike, in which two strikers were killed and many wounded, for the Federated Press. She also covered Hitler's rise to power, events in Stalin's Soviet Union, the lives of American factory workers during World War II, and reconstruction in Europe after the war. Vorse's travels to Hungary in 1919 and to Moscow in 1921 and 1933 fueled her gradual disillusionment with Communism, which came earlier to her than it did to most of her liberal and leftist friends. Her critical reassessment of Marxism-Leninism diminished her popularity in some circles, as did her later refusal to embrace anti-Communist fervor once Stalin's crimes had become apparent and the Cold War had begun. Vorse would not sanction the persecution of American Communists or the nuclear arms race with the Soviet Union. Mary Heaton Vorse died peacefully at home on 14 June 1966. She left two sons, Heaton Vorse of Provincetown and Joel O'Brien of Westport, Connecticut; as well as a daughter Mary Ellen Boyden also of Provincetown. Note: This article deals with the family of Hiram and Ellen Blackman Marvin Heaton and their daughter Mary Heaton Vorse. It is not a discussion of Mary Heaton Vorses' career or works. That is outside the scope of this writing. All this from one simple cabinet card. I had no idea when I purchased the multigraph the treasure that it held. Garrison, Dee. Mary Heaton Vorse: The Life of an American Insurgent. Philadelphia: Temple University Press, 1989. 1870 U.S. census, Berkshire County, Massachusetts, population schedule, Stockbridge, p. 743, dwelling 397, family 398, Hiram Heaton (Head); digital images. Heritage Quest (http://persi.heritagequestonline.com/ : retrieved 7 August 2008); citing NARA microfilm publication M593, roll 602. 1880 U.S. census, Hampshire County, Massachusetts, population schedule, Amherst, p. 275, dwelling 402, family 434, Hiram Heaton (Head); digital images. Heritage Quest (http://persi.heritagequestonline.com/ : retrieved 7 August 2008); citing NARA microfilm publication T9, roll 537. 1900 U.S. census, Hampshire County, Massachusetts, population schedule, Amherst, p. 2, dwelling 20, family 22, Hiram Heaton (Head); digital images. Heritage Quest (http://persi.heritagequestonline.com/ : retrieved 7 August 2008); citing NARA microfilm publication T623, roll 653. 1910 U.S. census, Hampshire County, Massachusetts, population schedule, Amherst, p. 46, dwelling 20, family 22, Hiram Heaton (Head); digital images. Heritage Quest (http://persi.heritagequestonline.com/ : retrieved 7 August 2008); citing NARA microfilm publication T624, roll 593. Hiram Heaton. Cabinet Card. ca. 1894. Privately held by the footnoteMaven, [ADDRESS FOR PRIVATE USE,] Preston, Washington. 2008. Hiram Heaton Gardening by F. H. Marvin. Snapshot. ca. 1909. Privately held by the footnoteMaven, [ADDRESS FOR PRIVATE USE,] Preston, Washington. 2008. House on Amity Avenue. Digital. 1879. Privately held by the footnoteMaven, [ADDRESS FOR PRIVATE USE,] Preston, Washington. 2008. Ancestry.com. U.S. Passport Applications, 1795-1925 [database on-line]. Provo, UT, USA: The Generations Network, Inc., 2007. Original data: Emergency Passport Applications (Passports Issued Abroad), 1877-1907 (M1834). Harde, Roxanne. "Mary Heaton Vorse." American Radical and Reform Writers: First Series. Ed. Steven Rosendale. Dictionary of Literary Biography Vol. 303. Detroit: Gale, 2005. Literature Resource Center. Gale. KING COUNTY LIBRARY SYSTEM. 9 Aug. 2008 . American National Biography Online, Mary Heaton Vorse, accessed 9 August 2008. Another sensational, fascinating, brilliant article! Thank you so much for this. That fivefold multiple exposure trick is really interesting. It looks like someone having a dinner party with themselves. Wow, an amazing story. I'm blown away with what you are able to come up with based on just a name on the back of a photograph! Fascinating story! You never know where a story will end up.